Here's the deal, it's pretty straight forward. Below are some screenshots of RISC OS 5.02, the 32bit variant of RISC OS that powers the Castle Iyonix range of computers. The shots were taken from drobe.co.uk reader Simon Wilson's Iyonix machine and annotated by Simon himself (edited by Chris) - thanks Simon! To view the full screenshot, click on the relevant thumbnail. The standard applications in the Apps folder. !IyoUpWtch is the application used to check for updates from Castle and download them. It can run in the background and notify the user when updates become available. 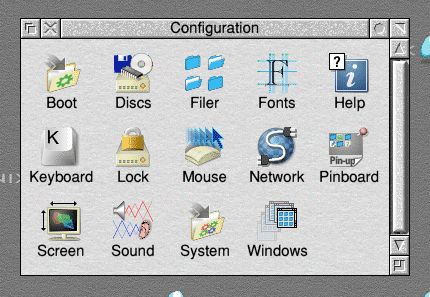 Draw, Paint and SciCalc running, showing the new icons for each. In the top right is also a window that has been iconised to the Pinboard. The new icons in the !Boot configuration tool. The jigsaw look from RISC OS 4 has been dropped. A directory viewer showing how some of the new icons look together. The directory icons (including !Boot and the Archive image) are angled, making it clear that they are different to ordinary files and giving the OS a further 3D appearance. This is a 1600x1200 screenmode, but my monitor can only handle this resolution at 56Hz! A file transfer is in progress from the Iyonix to a PC on the same network. Without the DMA controller active, the processor must move memory around, so the processor usage is quite high. The transfer speed is also bounded by the current IDE speed, but DMA has been suggested by John Ballance of Castle to be in the next RISC OS update. Popular applications such as Ovation Pro, FTPc, Artworks (the rendering module only for now) and DigitalCD run perfectly on RISC OS, though a module in Oregano2 seems to interfere with some modules that play music. The network configuration utility has been updated, like with other configuration utilities, to be more user friendly. A green indicator below each broad networking protocol shows whether or not the protocol is active. As with the networking configuration utility, some wording has been changed from confusing jargon to plain english. A facility to pick random textures is also given and all of the textures look very professional. Graduated backdrops cannot be used as they can with the version of Pinboard included with RISCOS Ltd's Select. A look at the new icons for the RAM filing system, OmniClient (which is bundled with the Iyonix) and Printers. Welcome to RISC OS 5. The default look of RISC OS 5, with the Iyonix tiled backdrop selected. Notice the default 2D look of the iconbar. The extra visual flags can be turned on simply by adding an Obey file to Choices.Boot.PreDesk that turns these visual flags on. RISC OS 5 has a slightly different set of window tools to RISC OS 4. The iconise button is simply a circle and the toggle size icon has been clearly altered. The option to set the directory as the CSD was missing in RISC OS 5.00 and 5.01, but was added to the latest version (5.02). Until now I was littering my hard drive with !SetCSDHere Obey files! RISC OS 4 has had this feature for a long time. The task manager display on a clean machine. Notice the size of the "Free" slot! The next slot can indeed be taken right up to the full memory capacity of the machine. Notice that "Screen Memory" is listed as claiming 0 bytes. Perhaps this is due to screen memory being held outside the system RAM. However, memory can be allocated here. The configuration tool for window behaviour, again showing some changes in the descriptions. "Protect built in icons" is more meaningful than "Protect ROM sprites" to your average user.